Well, I received my crumpet rings. They are very light aluminum, I think, and have a non-stick coating on them but you still need to grease them really well before you fill them with your batter. A hot plate is good but a large frying pan will also suffice. 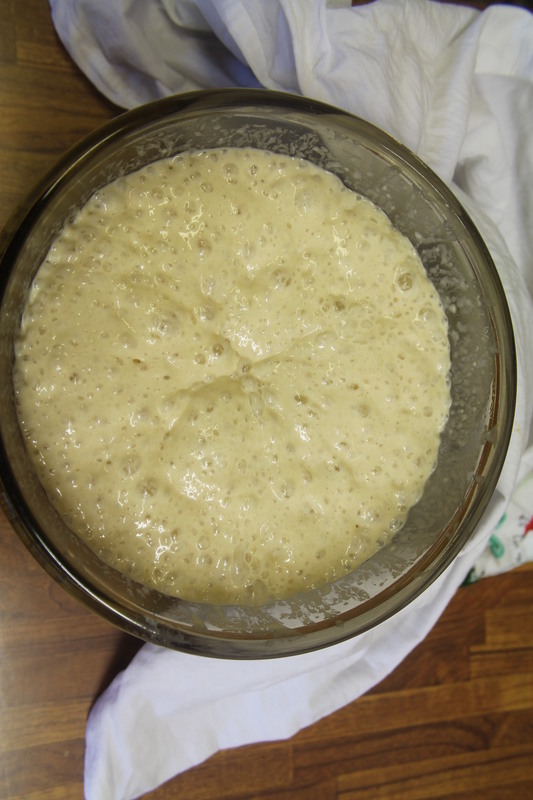 You need to start this process early because like baking bread you need to leave the batter for one hour in a warm place. Heat the water and milk until lukewarm (I used the microwave). Sieve the flour into a large bowl and add the yeast, baking powder, sugar and salt. Make a well in the centre of the flour and pour in the liquid, mix with a wooden spoon and then using an electric mixer whisk until a good batter is formed. Cover the bowl with a damp tea cloth and place somewhere warm for one hour. The batter will have risen well and have bubbles on top. Heat the frying pan or griddle and then add a knob of butter, make sure the inside of the crumpet rings are well buttered and place in the pan or on the griddle. Now add about 2 tablespoons of the mixture to each crumpet ring. The mixture is very ‘gloopy’ so it is not easy to place the batter in. I put a little more than 2 tablespoons in at times but this just meant I had thicker crumpets! Cook on a medium to low heat for about ten minutes. 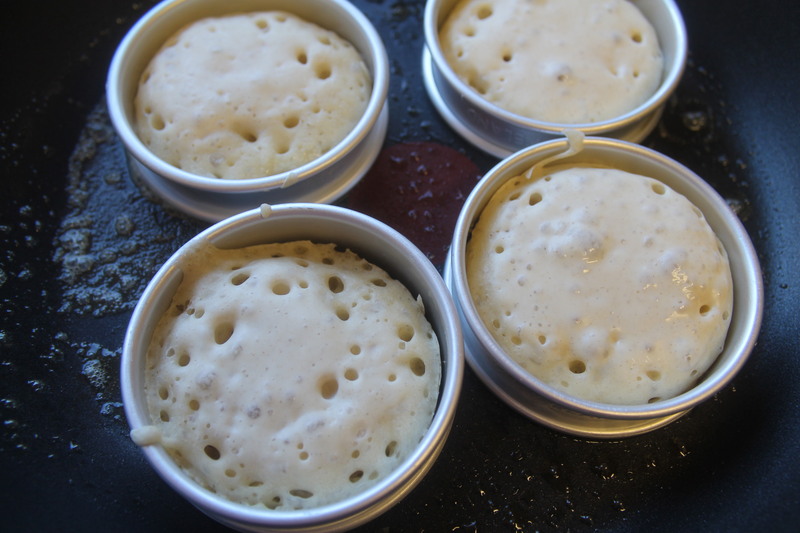 The surface will bubble and form holes and basically start to look a lot like a crumpet! The top will dry out and the crumpet will shrink away from the sides of the ring. At this point you need to take the rings off and flip the crumpet over to brown on the other side. Be very careful – the rings will be HOT! If you have not greased your ring properly it will stick and you will not be able to get the ring off! You can serve immediately with butter and jam or a savoury topping like scrambled egg but you can also store them and then pop them in the toaster. If you are going to eat them with a sweet topping then you can increase the sugar to 1 tablespoon. Online Stores, Inc., and The English Tea Store Blog, 2009-2015. Unauthorized use and/or duplication of this material without express and written permission from the blog’s owner is strictly prohibited. Excerpts and links may be used, provided that full and clear credit is given to Online Stores, Inc., and The English Tea Store Blog with appropriate and specific direction to the original content. 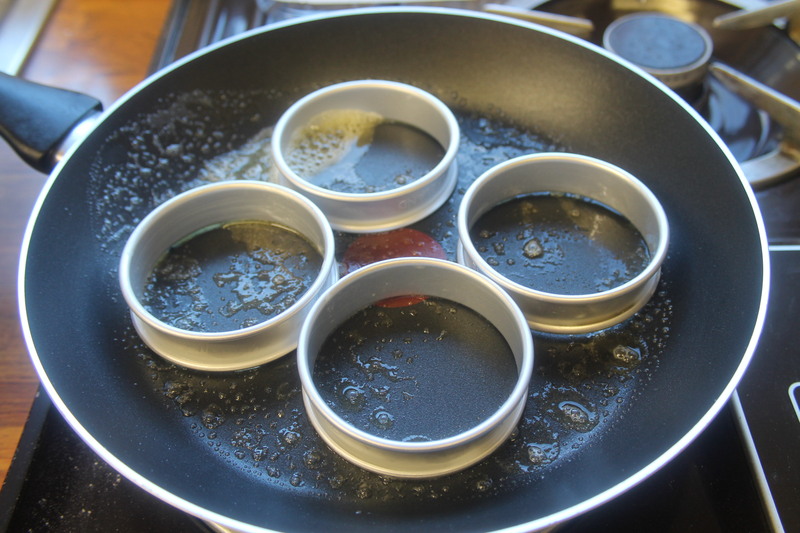 Julia, I like that you buttered the rings. Why use anything but butter?! And yet many will use oil or cooking spray. 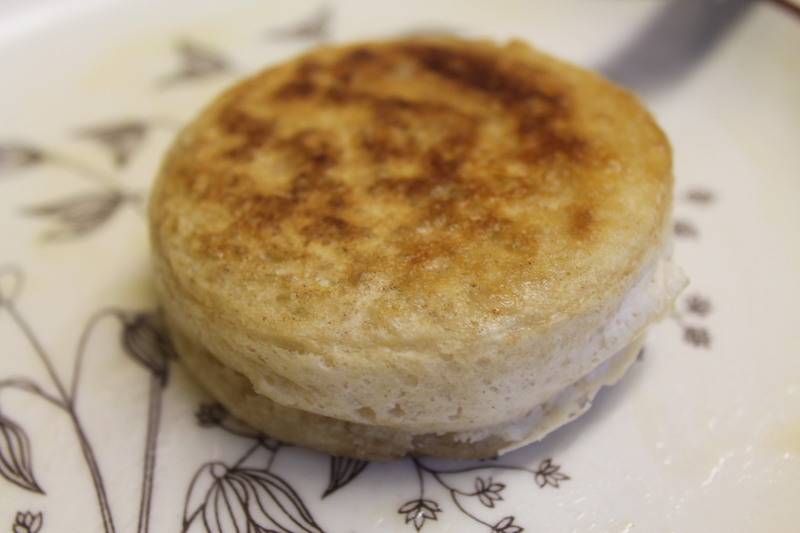 Funny, I just posted my crumpet recipe on March 19, if you want to check it out. I’ve just had such a craving for crumpets and muffins lately and can’t stop making (and eating!) them!